Over these past 20 years I have maintained a 3200 sq. ft. studio in one of the 1860 granite mills of Fall River, MA. I describe myself as an "architectural artist," collaborating with architects in developing spaces. My art often solves problems. Many installations have been health care related and a few have been in restaurants to increase coziness and reduce sound. Working with Acorn Structures architects led to the installation of Sailshade solarium solutions in the Acorn Structures model homes in NJ, MD, MA and MN through the 1980's. For most of my years at Mount Holyoke College I was both an astronomy major and an art major. Blending science and art has been integral to my life until one day I was presented with a problem by an architect friend. Could I make an insulated shade that goes over the window and that when up doesn't cover any glass? This was 1979. Sailshade came into existence with unique design features. It formed a cornice-like effect when raised. I began calling this a "self-creating valance." It was also much sturdier than conventional roman shades. Within a few years it had a "lift-the-dot" snap system on a finished hardwood headboard, also unlike any conventional shades. I delighted in how our insulation was not soft and puffy, but more stiff, and would behave like interfacing in a collar. Sailshade design was now on track for an aesthetic look that included high performance in terms of energy efficiency. Owners began reporting more than one third energy savings when an entire house was Sailshaded. We do not have formal data because many new houses included Sailshades from day one, and older houses often did only the main rooms. Sailshades are an architectural element. Most roman shades have baggy folds that hide much of the window when they're raised, but Sailshades nest in a compact space because of a unique proportion system. Even on a 7.5-foot-high sliding glass door, a Sailshade nests completely off the glass in a space of less than one foot, maximizing solar gain. 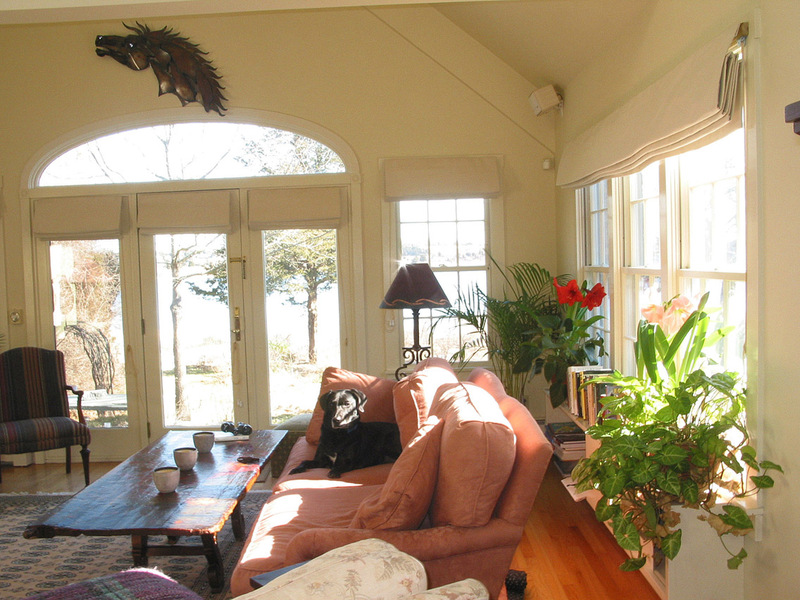 Raised during sunny winter days, Sailshades allow the interior of a home to be warmed by the sun's rays. Lowered during winter evenings and nights, Sailshades create a wall of insulation. A Sailshade installation can become a wall of original art also, with many installations having unique appliques, designed by Susan Mohl Powers. Visit: www.sailshadestudios.com. 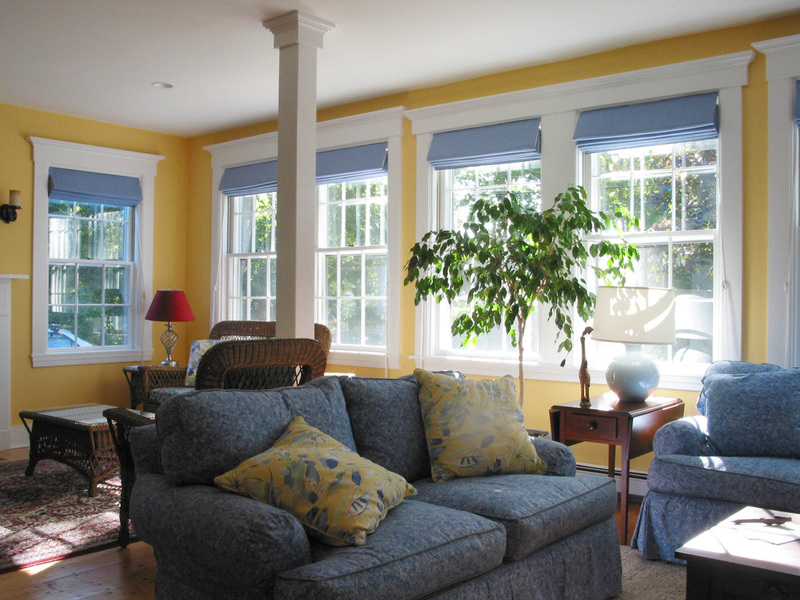 On sweltering summer days, by lowering Sailshades in the eastern windows in the morning and the western windows in the afternoon, a home can remain cool and comfortable, greatly reducing exorbitant air-conditioning costs or maintaining lower temperatures when there is no air conditioning system in the space. In a joint effort with www.low-e.co.uk, Sailshade is poised for a new market in the UK. Replacement windows are not permitted by www.english-heritage.org.uk in the historic buildings. Heat loss through windows is therefore an even greater issue in the UK than in the USA. We anticipate great receptivity in the UK to Sailshade, putting www.low-e.com into windows.